So I heard from Robert Scobles blog, who heard from Neowin.net, who heard from MSBlog that the Public beta of Windows Vista is now available. It is a big 3.13GB DVD ISO download but Microsoft are using Akamai's download manager to help every one get it. Opera has been my favourite browser since it release version 8 and made it free. It is at version 8.5 at the moment and version 9 is expected in March, but labs.opera.com have released a preview of the new browser and it looks brilliant. Looks are the same, but the new features are going to make this browser a must have. Opera were the first to integrate tabbed browsing but Firefox really made it popular, but with the new version 9 Opera gives us a much needed feature, one I have wanted for a while. It is the ability to switch through the open tabs with a keyboard shortcut, much the same way you can switch between open windows with ALT+TAB. The short cut is CTRL+TAB and lists the open windows in the center of the screen allowing you to easily select the tab you want. 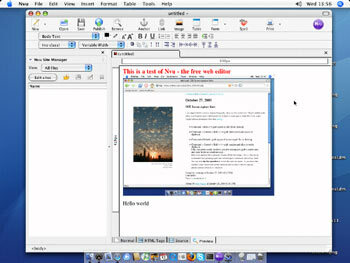 Pressing CTRL+TAB displays open tabs in the center of the screen. A closer view of my open tabs. The other nice feature is the thumbnail’s that now appear when you place your mouse over a tab so you can ‘preview’ the contents of that page. I think this could be very useful for people like me who like to open lots of tabs. The thumbnails were a little slow to appear which could just be caused by my slowish computer, but I am sure the final release will perform better as they normally always do. Place your mouse over a tab for the thumbnail to display. A closer view of the thumbnail. Other new features of Opera 9 are ‘widgets’ which are much like Konfabulator or Dashboard widgets. Reviewers have not been enthusiastic about the widgets, but I am sure they will develop further and be of use. Opera 9 is also the first browser to support the downloading and seeding of BitTorrents, which even though most people will use a standalone client is a nice inclusion as lots of IPTV show distribute their content via BitTorrent and using it within the browser will make it easier for others. So far I am very happy about the features in the preview of Opera 9 and have had no stability issues or problems, which is something I can not say for the recent IE 7 Preview which freezes constantly. 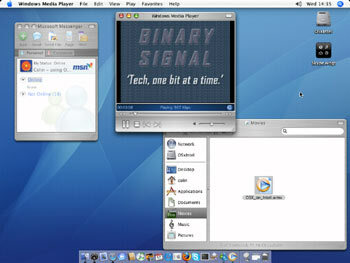 I have spent most of this morning using OSX and trying to 'understand' it. So far, I have determined that Skype just isn't going to work and I am guessing it is because I am using the OSX Intel Developer release. I have had successes though. I installed MSN Messenger and Windows Media Player fine, but it is funny that I am using Apple's OS but some of the first programs I need to install are Windows applications. I got the Firefox install sorted out. One big failure I had with OSX was trying to install OpenOffice. The installer would run and seemed to almost complete but it would just get stuck on installing a script file, so I had to cancel the installation. I managed to work out the keyboard combination (thanks Google) so that I could capture screen shots and took a few, however, I could not work out how to resize the images in iPhoto, so I will have to resize them and post the screenshots when I am back on Windows. Looked like the install would work, but stalled soon after. Trying out Nvu which I heard about from StepOnePro.com another IPTV show. My final thought of today is could/would I move to OSX permanently or at least make it my second OS. At the moment Fedora Core is my second OS as I have a spare AMD based PC to use it on, if I want to use OSX I have to remove the XP hard drive from my P4 and insert the Mac one. The PC is a slim line desktop PC so has no space for both drives. 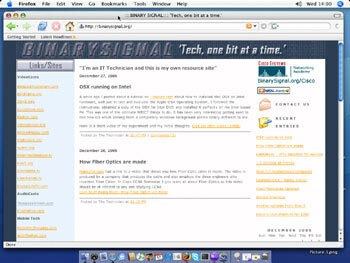 One possible possibility is that I install OSX under VirtualPC, but I fear it would become too sluggish to be useable. My one big tie to stick with Windows is Outlook but if I could setup Exchange correctly I could have my Outlook via Outlook Web Access and then I could be completely platform independent. So would I make the switch?? If I had the money for a dedicated OSX PC or a genuine Apple PC then I would probably switch, but for now I think my time is better spent learning Fedora Core as I already have a separate PC for that. In my quest to get OSX running on Intel I have been researching about OSX so once it is all ready and installed I can actually use the OS. 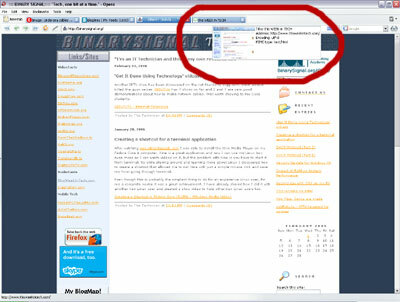 Luckily a link was posted on digg.com of a site with free videos giving you an orientation of OSX. They also have a page with Windows videos. 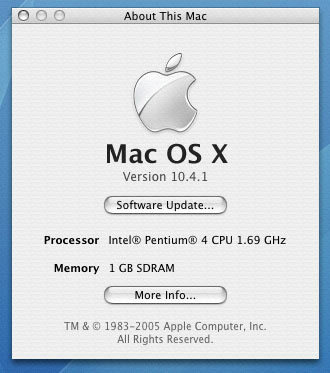 Mac OS X 10.4 Orientation - Atomic Learning, Inc. I have mentioned Microsoft Data Protection Manager before when it was in Beta and now it is a full Microsoft Server software application. Unfortunately I do not have the hardware requirements at home to test the application and have not had the opportunity at work to try it. From the information I have read on the Microsoft site I believe it would be of great benifit in our opperation as due to our 'student users' work is often deleted before an overnight backup, and DPM can back up data to the central DPM server every hour during the day. DPM also allows for faster recoveries saving us and the user a lot of time. We have a 'spare' test server at work so I am hoping to implement it into our network infront of our current tape backup server and see how much easier and more reliable it is. Google have been releasing a lot of applications recently and the most exciting one is their new Instant Messaging and Voice over IP application. It uses the Open Source Jabber service and you can interact with its users from other clients like GAIM. The Google Talk application is very clean and simple to use like most Google services, and it ties into your Gmail account nicely and notifies you of any new emails. 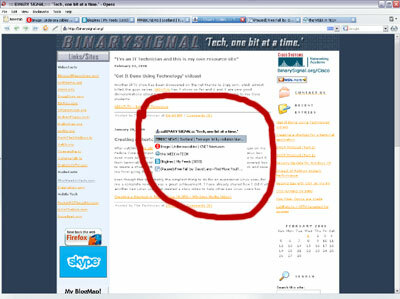 I have yet to test the voice quality of the service, so if you want to help me test it download the program and add 'BinarySignal' to your buddy list. Microsoft have released a Beta of Microsoft Shared Computer Toolkit for Windows XP which allows users to essentially lock down a shared computer so that setting and programs can not be altered. It allows you to apply Active Directory style Group Policies and Mandatory Profiles so workstations are secure. It has an easy to use User Interface (UI) and is primarily aimed at home users with troublesome children or small schools who do not have centralised security. There is a great video over at Channel9.MSDN.com which explains it all. Remember it is a Beta so ensure you back up your data before you install it. Last night I finally got Remote Installation Service to work on my network. I have read about it a lot and knew it was possible, but yesterday my brain was firing on all cylinders and I worked out the DHCP kink which was probably stopping it before. It was a very exciting time seeing my slim line Dell PC network boot and start the install. I still have to experiment with installing all the needed applications, like Office, and then creating a full image. You can see a short video of my setup here. It is created using the latest Divx version so you may need to update your player. The feeling of despair when you delete a much needed file or a hard drive becomes unreadable can be avoided, by first always having a recent backup and by using recovery utilities. PCWorld.com - Free Hard Disk Utilities: Recover Deleted Files and Lost Data review 4 different free applications for retrieving lost data. When I have some spare time I am going to try out these utilities on a problem hard drive I have and see if I can recover any of the data on it. With USB drives becoming more popular for transporting files and documents they are also becoming popular to transport programs. When you are not working at your own computer you can use your favourite programs that are installed on your USB drive. Portable versions of Firefox and Thunderbird are already available and this site 'The Portable Freeware Collection' has a good list of other portable software. Microsoft is building its server market with additional add-on server programs and recently Microsoft released a public beta for it’s Data Protection Manager for Windows Server 2003. DPM is designed to streamline disk based backup and allow for faster recovery of data and most importantly allow users to recover their own documents. Companies are moving away from unreliable tape backup and moving to disk based data centre backups and one company LiveVault have a very funny site promoting disk based backup. Microsoft offers a full 45-Day Trail Edition that you can download. I am lucky enough to have a number of computers to experiement with but if you are restricted to one computer I recommend downloading the trial and learning. I will install the trial myself and will attempt to make a ‘How to’ about using Microsoft Virtual PC to help new users. 'Think you know all there is to know about IT security? Put yourself to the ultimate test.' From May 2nd Microsoft is running a security competition where you can win a Tablet PC and also claim the title of ‘The European Gatekeeper Champion of 2005’. I have already signed up and you can to from the Gatekeeper Test website. The site has test questions and revision information so you can prepare for the test. Even if you don’t enter learning more about computer security is a good thing. You never think about backup software until it is to later. You either learn by your mistake or learn from someone else’s. Backup software is not just for big businesses and even as a home user you should have a backup plan. From hearing of another users hard disk failure and loss of data, I found Karen's Replicator a free backup solution that allows you to select files and folders to be backed up and scheduled. The files are backed up without any form of custom compression so if needed you can search your backup and just recover the files needed. I will setup a backup schedule before it is to late and I recommend you do the same. Do not try this XP modification on your working box. I just tried it and now the computer does not boot and gives a \system32\ntoskrnl.exe error. I am also having trouble restoring the installation too. It pays to be careful of what your install. I have learnt my lesson today. I found this comprehensive guide to setting up Windows XP Media Center Edition via DigitalMediaThoughts.com. It is a 16 page PDF file that contains screenshots of everything you need to do and prepares you well. Installing software is sometimes more than just clicking ‘next’. This 'How to' from Engadget.com shows you how you can make a home video security system with any simple webcam and some inexpensive software. As my home server is on all the time I may well install a webcam on it and have it monitor my home 24/7. HOW-TO: Turn your laptop into a home security system. I was recently asked by someone how they could completely erase their hard disk. 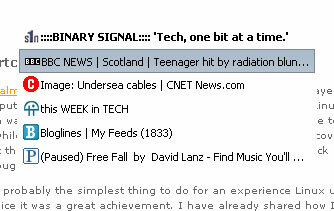 From the G4TechTV newsletter I found this application which appears to do the job very well http://dban.sourceforge.net/. I have not tried it yet, but when back at work I will try it out on an old machine we have.